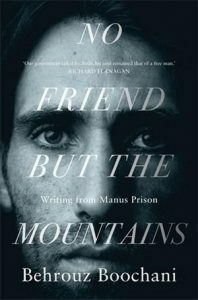 One particular news item that caught my attention was The Victorian Prize for literature, Non-Fiction award and the winner, Behrouz Boochani for his No friend but the mountains: writing from Manus Prison (Picador Australia). A Kurdish-Iranian asylum seeker and currently held on Manus Island, Boochani has been recognised as an Australian writer to win the $100,000 prize, the richest of its kind in Australia. Ironically the author has not been allowed to set foot in Australia by the system, yet. What is even more inspiring is that the author wrote the book on his mobile phone then sent it through WhatApp to an academic, Omid Tofighian, for English translation. The book has been awarded on its high literature merit with its beautiful writing style. A Judge described the book as “a stunning work of art and critical theory which evades simple description”. This award is not only a victory for literature, but more, a victory for humanity. One doesn’t need any government recognition to become a writer. And a writer can write anything, even under very harsh conditions. While there have been a lot of reported cases of mental illness, even suicides due to the cruelty in Manus camps, Boochani’s sheer focus of literature and resistance makes this book even more a must read. This entry was posted in Australian Authors, Non Fiction and tagged Australian Literary Awards, Behrouz Boochani, City of Parramatta Libraries, No friend but the mountains by admin. Bookmark the permalink.